Victoria L. (Vicky) Yade, 70, a longtime resident of West Swanzey, died October 22, 2018 at her home. She passed peacefully after battling Pancreatic Cancer. She was born in Keene NH on December 9. 1947 The daughter of the late Virginia (Casey) and Lester Fairbanks. She attended Keene schools and the University of New Hampshire. On Feb 1, 1968 she exchanged vows with Martin W. Yade in Millbrook, NY. They were married for 46 years until his passing in 2014. Victoria worked in the insurance industries since the early 70’s. Her “gift of gab” and genuine care about her client’s wellbeing helped her customers feel safe and secure in their insurance coverage. Victoria loved horses and competed in equestrian competitions. She and her husband also purchased, trained and showed them all over New England. 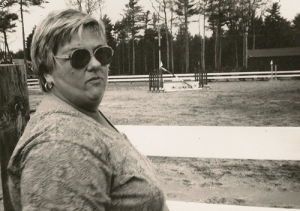 She loved to vacation in Saratoga, NY every year to watch the thoroughbred racing and relax at the many casinos with her friends. She also enjoyed relaxing on the beaches of Maine. Vicky loved playing cards with her family, mahjong and bingo with friends and was always ready for an Impromptu trip to any casino. Survivors include her son, Clinton Yade of Leesburg VA, step mother Sylvia Fairbanks of Keene, NH, brother Lester Fairbanks of Chesterfield, and sister Katherine Bleau of Keene, along with nieces, nephews, cousins and many close and loving friends.